^ Kennedy, Gregory P. (1983). Vengeance Weapon 2: The V-2 Guided Missile. Washington DC: Smithsonian Institution Press. pp. 27, 74. ^ Neufeld, Michael J (1995). 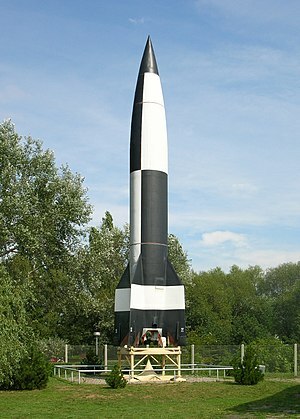 The Rocket and the Reich: Peenemünde and the Coming of the Ballistic Missile Era. New York: The Free Press. pp. 73, 74, 101, 281. ^ Kurt, Magnus (1999). Raketensklaven. Deutsche Forscher hinter rotem Stacheldraht. Elbe-Dnjepr-Verlag. ISBN 9783421066350. ^ a b c d e f Boris Evseevich Chertok (2006年). Rockets and People: Creating a rocket industry. 2. Government Printing Office. pp. 40-51. ISBN 9780160766725. http://history.nasa.gov/SP-4110/vol2.pdf.